This week the Harvard Gazette published an article on the “new test for Down syndrome”. It contained the usual offensive language about our community. It contains the usual misleading information about screening. It introduces a new Trojan horse of a “future treatment” to defend harmful current practice. All in a brief, typically medical focussed, article that uses smoke and mirrors to defend Down syndrome birth prevention programs. 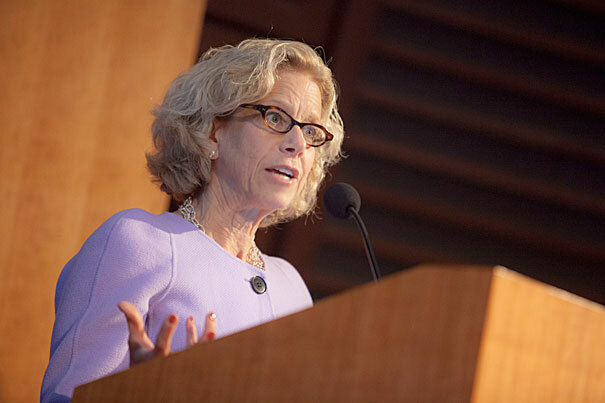 The article reports on a presentation by Diana Bianchi, executive director of Tufts Medical Center’s Mother Infant Research Institute at the Harvard Medical School. She has a long record of being involved in developing and promoting birth prevention measures against the Down syndrome community. The Tufts Medical Center represent themselves as “an internationally-respected academic medical center – a teaching hospital where we pride ourselves not only in the sophistication of the care we provide but the compassionate way in which we provide it.’ The Harvard Medical School themselves has, as a Core Commitment, the noble “Service to Humanity”. Unfortunately we see little compassion or service to humanity in the article. One is left wondering how many people with Down syndrome Bianchi knows and loves. To set the context: when discussing screening for Down syndrome we firstly need to acknowledge that mothers are under health care for the loving, nurturing and trusted support of their wanted pregnancies. Some parents choose screening and/or diagnostic testing to prepare for the birth of their child in a way that is respectful and loving towards their child. However, almost all unborn children diagnosed with Down syndrome are selectively aborted, with further wanted pregnancies lost through invasive testing which carries the risk of causing miscarriage and harm to an unborn child. The dignity of a child does change with a diagnosis of Down syndrome. We advocate that the focus on health care and the love and support of that wanted pregnancy shouldn’t change as a result of a diagnosis. Any discussion that simply presents advances in screening as a “good thing” without addressing the inherent harmful, discriminatory, ablest and eugenic outcomes of current practice offends the basic principle of the dignity of all human life. So, in the very opening statement we have Down syndrome presented negatively as a “risk”. There is nothing wrong with having Down syndrome, is a naturally occurring condition that has always been part of humanity. Presenting a group of people as a “risk” reflects the discriminatory bias of the author. It has nothing to do with those with Down syndrome, who have dignity, like all of us, by simply being human. We then have new noninvasive screening presented positively to avoid amniocentesis. This is because amniocentesis caries the risk of death and harm to the unborn child. Whilst reducing harm through amniocentesis is a good thing, the implication here is that reducing harm to unborn children without Down syndrome is a good thing, whilst continuing, or even increasing harm, to those with Down syndrome is not considered to present a concern – remember that almost all unborn children diagnosed with Down syndrome have their lives ended by medical intervention. The ethical response to harm is to reduce harm to all on an equal basis. What we have here though, is an unspoken view that the value of one group of human beings has worth and shouldn’t be harmed, whereas the other group (we all know which one) can be harmed because of their genetic difference. Only the collateral damage seems to present a concern to the promoters of new screening technology. It can’t even be implied that the new tests are safer or reduce the need for amniocentesis. As pointed out in a previous blog relating to screening in the UK, the new tests were hailed as potentially saving 300 lives per year. But, when you break it down it actually means that the saving of 300 “normal” babies could be at the cost of over a further 700 babies with Down syndrome who are selectively aborted, resulting in a potential net increase in harm of around 400 lives a year lost. So the new tests likely increase harm to pregnancies. It’s just that some lives are more valued by the promoters of screening than others. Bianchi is an expert in this area and should be upfront and honest about these matters. Bianchi then introduces the Trojan horse argument that the new tests present an opportunity to improve cognitive function of babies. This is a Trojan horse because the new tests are about reducing harm to “normal” babies whilst finding those with Down syndrome for selective abortion. There is no therapeutic benefit to the child that relies on a diagnosis before birth. Birth preparation and increased pregnancy care can be made following an increased chance screening result. Parents who want to know before birth for their own preparation through an (almost) definitive diagnostic test such as amniocentesis or CVS should be clear about the risks to the health of their child, which statistically outweigh any likely benefit to their child. Screening programs have only ever been developed to prevent the births of people with Down syndrome because of society’s negative bias against them. Government’s fund national screening programs because birth prevention is considered to be cheaper than providing support. Bianchi’s statement is also a Trojan horse because she is speculating that a future possible “treatment” may be available. A future possibility cannot be used to justify a current action that harms the Down syndrome community, that’s ethics 101. To suggest that some “future oppurtunity” may arise to defend current advances in stopping people with Down syndrome from being born is offensive. Then there is the whole concept of improving cognitive function itself. Again, Bianchi is starting from a discriminatory bias, this time that there is something wrong with people with Down syndrome and that they need improving. It’s the old, tired and failed medical model of disability. People with Down syndrome, are, well, people, and we don’t generally go around telling other people that they need fixing. Our community faces daily discrimination from a society that disables those with a genetic difference. Rather than assuming we need to “improve” people with Down syndrome, we first need to be having them at the centre of the debate and remove those social barriers they face, rather than having the medical profession tell them what is best for them. So, in one short paragraph Bianchi has presented Down syndrome negatively as a risk, presented their lives as of less worth than their fellow humans, falsely implied that the new tests reduce harm when they are likely to increase harm, and presented a Trojan horse that a harmful screening program may have a future benefit in fixing people with Down syndrome rather than stopping them being born. This is not correct. In the US professional medical societies for obstetrics, genetic counseling, and prenatal diagnosis have issued statements saying the test is only recognized for women already considered at a higher chance for having a child with Down syndrome. That’s very different from “all pregnant women”. There is no justification as to why women should undergo screening for Down syndrome or undergo amniocentesis or CSV and expose their children to harm. It is just presented as something that should be done. No therapeutic benefit is proposed, which places it as being unique amongst other life affirming medical practices. It’s as if were invited to accept that “Doctors know best” and embark blindly down a path that can harm our children because they have decided that people with Down syndrome are less human than others. “Those alternate screening tests miss 8 percent of Down syndrome cases, however, and also give false positive results about 5 percent of the time. That means that some women may undergo amniocentesis, which, in addition to being invasive, bears a slight risk of causing miscarriage. Now there is a whole heap of confusion going on here. On the one hand she is saying that “alternative screening tests” miss 8% of cases and that the new tests would reduce the number of amniocentesis. That’s misleading, the new test is a screening test that gives a chance result. A diagnosis requires an invasive amniocentesis or CVS test. To find the missing 8% would require invasive tests for those pregnancies. Given that almost all diagnostic tests result in the death of the patient, those 8% may actually be happy to have escaped the screening net. On the other hand she adds confusion by bringing in the 5% false positive results. These are pregnancies with a positive screening for Down syndrome when the child doesn’t have Down syndrome. Most of these unborn children are killed through a selective termination or from an invasive test. But, this is all smoke and mirrors. The underlying assumption here is that harming those without Down syndrome is wrong and that harming those with Down syndrome is acceptable, or even desirable. Two class of human beings, one worthy of life, the other unworthy of life. This attitude by medical professionals is offensive and devalues the lives of those living with Down syndrome and other disabilities. Anything that devalues the lives of people with Down syndrome is unacceptable. The ethical focus would be to reduce harm to all of those pregnancies. “Bianchi pointed out some of the pitfalls to approaches that utilize prenatal screening, including the potential for physicians to learn uncomfortable information, and be faced with the difficult decision of whether to share it. Another challenge, she said, is the pressure not to make a mistake, since some disappointing results may prompt parents to terminate a pregnancy. Again, the negative language in “disappointing results” as if children are some sort of disposable commodity. And, the inference that a termination of a pregnancy as a result of a mistaken diagnosis would be a bad thing (and it is), whilst terminations involving Down syndrome is just “giving parents accurate information”. Two classes of human beings. One worth saving, the other not. And the need to be accurate – we wouldn’t want them slipping through the net now, would we? The Harvard Medical School has as a Core Commitment of “Service to Humanity”. On this occasion, though, they have failed miserably in that goal, doing the Down syndrome community one big dis-service in their article. Not so, with one of their esteemed Associates though, who shows how this subject is handled according to the principle of service to humanity. International disability rights expert Janet E. Lord is a Senior Research Associate of the Harvard Law School Project on Disability. She has recently published an extensive paper on the application of the UN Convention on the Rights of Persons with Disabilities (CRPD) in relation to disability screening programmes. Her qualifications in this field are impeccable. Ms. Lord participated in all of the drafting of the CRPD, serving as advisor to lead governments, expert to the United Nations and legal advisor to Disabled Peoples International. She is a leading expert on the CRPD, publishing widely in the field and designing and implementing disability law and policy reform in more than 30 countries worldwide. She knows her stuff and walks the talk. “A disability rights critique casts serious concerns over the wave of genetic testing, in particular antenatal screening. The Harvard Gazette article vindicates all that Janet Lord has explained with such clarity. So, when we see articles from medical folk like Bianchi that simply ignore a disability rights framework, let us see it for what it is. A fundamental breach of the core principles of human rights, a breakdown of commitment to serving humanity and an absence of compassion from a medical community that should be protecting the very community it harms. Thankfully we have true advocates such as Janet Lord who work tirelessly to defend the dignity of all life and are at the coal face of a new wave of disability advocates pushing back against the new wave of medical eugenics against the Down syndrome community. All life is precious, and we must support that through unconditional love and compassion. Excellent points, Mike. Any thoughts on what can be done to push back on this? Hi Stephanie. We have secured a project with the New Zealand Human Rights Commission to deal with the disability rights perspectives of screening and disability selective abortion and are just awaiting some more details before we get more word on that. There are some other social justice initiatives developing in New Zealand and overseas that are just getting some more traction, and again will become more public. The UK Parliamentary Inquiry into disability selective abortion has recommend as one option the repeal of disability as grounds for abortion, so watch that one too. Meanwhile we need to keep raising awareness and challenging the medical bias as actively as we all can. This is wonderfully written, and expresses my deepest feelings in a way I am inadequate to express. thank you. It is a travesty that being human is considered, “disappointing”. I am extremely in love with my now 17 year old daughter, who just happens to have the extra no. 21. The world is a better place just because she is in it. If only parents who have refused to experience the joy their aborted life would bring if only given the chance. Thanks Sherri. You have captured it beautifully. What a brilliant article,for many years we were told that a man called Adolf Hitler introduced to the world the Aryan Race, whereby you can be selective about the type of child you could have and he set about destroying any human being whether born or unborn who did not fit the criteria. This of course was only part of what occurred and many men and women gave their lives in fighting this. Now in this brilliant modern world we live in we have as shown and proven in this brilliant article the forerunners of Dr Mengele carrying out genetic selection to make the world a perfect place. My wife and I have a fantastic 12 year old daughter with Down Syndrome who brings to us and anyone that knows her joy,laughter and a great insight into understanding Down Syndrome. Thank you John, the parallels to T4 are deeply disturbing. I have a 40 year old son with downs and just can’t believe there are people this barbaric what is in there heads? The Hitlers of today are the profits of the pharma industry. Their executioners are the politicians saving budgets on welfare and medical treatment. Willfully bringing severely physically and mentally disabled people into the world is illogical. Comparing prenatal screening to Nazism is asinine. We talking about Down syndrome, but feel free to rebut the post if you like and present a reasoned coherent argument. You are the only one here talking about “severely physically and mentally disabled people.” Everyone else is talking about people with Down syndrome. Join the conversation! I thought at first this was a sardonic article. If you don’t have the common sense to understand that a person with Downs Syndrome was born with a handicap, then what can a person say? Do you wish you had Downs Syndrome? If we somehow discovered a gene therapy to give you Downs Syndrome, would you take it? What you are doing is trying to burden society with unproductive members that you yourself will never be able to afford to care for – instead you are prescribing that burden onto others. I am not advocating murdering people born with Downs Syndrome, but for goodness sakes ought you at least offer the choice of terminating the pregnancy to the mother who will be faced with caring for such a high maintenance child for the rest of her life?? Mike Sullivan, you are shameful. Thanks for reading the blog Brad. Of course it a serious article and your comments vindicate the very points I was making, so thank you for showing that. Like Bianchi, I am wondering how many people with Down syndrome you know and love? It seems unfair to judge as others as being less worthy than yourself, but then it’s not about you, we advocate for those with Down syndrome who you choose to devalue with your own bias against them. Brad you might want to consider how “unproductive” society has been in the past in understanding and accepting people with Down syndrome. Where would any of us be without government provided schooling and other social activities? You might also wish to reflect on the real burdens in our society. Rest assured they are not people with Down syndrome. Brad, take a grip of your life: you need to think carefully about your values. What constitutes “productive” or “unproductive” – many people with DS contribute a huge amount to their families and to society. What gives you the right to judge another, harmless, kindly human being, based on their economic output? We might as well replace the human race with robots, they can work 24/7, would that suit you better? So, can I assume from this that there is no need for any special adaptive services since the conditions in question are not really pathological”? Thank you for reading our blog. The quote that you refer to is an acknowledgement that labelling people with Down syndrome as “abnormalities” and “pathological defects” is offensive to them and shapes and reinforces discrimination towards them. They are people. Is a person’s value determined by their capabilities? Is it diminished by their needs? I’m not saying that I agree with all of views advocated by this article (see my post elsewhere in the comments), but I think it is important to provide all of the respect, compassion, understanding, and value of human beings with disabilities that we provide for human beings without disabilities. Which, sadly, people by and large do not seem to do. Sounds like we would be better off without Brad Arnold. I agree with Brad Arnold. Well said! I am always amazed when I hear the statistic that 90% of pregnancies identified as T21 are terminated. It shocks and saddens me. But then I see people like Hank and Brad and realize that there are actually a lot of people out there who belittle and devalue people with DS. I think we can see that Hank and Brad would definitely be in the 90% if their unborn child was diagnosed with DS. I’m glad that my friends and family chose to support me when I had a child who was born with Down Syndrome. I know that my child will contribute to society in many ways, despite the fact that you may think he will only drain society. While I disagree with any notion or implication that deems anyone (in this case, those with DS) to be of lesser worth, I also can’t condemn those who are unwilling to see a DS pregnancy to term. If they aren’t willing or feel unequipped or incapable of caring for a DS child, I don’t see what good it does to override the parents’ wills and force them to keep an unwanted pregnancy. It’s heartbreaking, and I honestly do not know what I would do in this situation. I really don’t. If there was a test to eliminate nasty mean-spirited people before they were born, should it become compulsory, I wonder ? Every life is of equal value. I’m not anti-abortion as such, but I am very concerned about any state-funded programme that is actively involved in trying to ‘improve the race’ by deleting people simply because they have DS. My son has DS, he is 19, and he is a wonderful and compassionate human being who contributes so much to my family and community. He is also very fit and healthy. I can’t imagine my life without him: he gives me purpose and is the best companion I have ever known. My heart goes out to the voices represented by the views in this article. This is a tough subject regardless of your views. Indeed, I find the concept of unqualified compassion, respect, understanding, and dignity for the disabled to be criminally underrepresented in these discussions. In terms of setting policy to forcibly prevent abortions on the basis of *any* set of criteria (in this case, whether or not the child has Down’s Syndrome), I cannot see how we can possibly do so without imposing undesired pregnancies onto women. Yes, the article specifically deals with pregnancies that are wanted before any screening has been done. But it is only by her consent (and her consent alone) that her body be utilized by the unborn child. If one accepts the premise that everyone has the inalienable right to determine what does or does not happen to their own bodies, then it seems to clearly follow that a pregnant woman can revoke the consent to the pregnancy for any reason she deems sufficient. Even if the unborn child has a right to life, said child does *not* have the right to anyone else’s body. If information about the unborn child causes the formerly wanted pregnancy to an unwanted one, is it justifiable to say, “sorry, no take-backs – you surrendered the right to your body when you decided you wanted this baby” ? I am NOT saying that people with Down’s Syndrome shouldn’t exist, or that they are in any way ‘less’ than someone without Down’s. But I don’t think it does anyone any good to be coerced into a situation that they explicitly do not want to be in. Forcing someone to carry a child they feel unwilling, unable, and/or unequipped to carry/care for seems cruel for all parties involved, even the child. I think it is grand to try and shift the culture towards the idea that disability is not defective, and to try and implement policy and practice that provides parents with the necessary support and resources they require to raise a child with special needs. Beyond advocacy and concern over the negative consequences of advances in screening technologies, however, I don’t think there is any way to coercively prevent selective abortions of Down’s Syndrome pregnancies without transgressing against the rights of the mother. “If information about the unborn child causes the formerly wanted pregnancy to an unwanted one, is it justifiable to say, “sorry, no take-backs – you surrendered the right to your body when you decided you wanted this baby” ?” Do you think it is justifiable if, after 3 years it turns out that the child is autistic, a mom says: “I didn’t sign up for that, make it disappear”? When is the cut-off limit or is that the abortion limit that every country has and happens to be different all over the world. Which country would have it ‘right’ in that case? Is it 13 weeks, or 22, 40 or zero? Maybe it is after birth, like it happens in the Netherlands or Belgium where infanticide is legal? Shouldn’t the informed choice be made by parents before trying to become pregnant? Prenatal health-care should focus on informing prospective parents that there are no guarantees in life (neither before or after birth) instead of reinforcing the illusion that children are merely a reflection of what we believe to be perfect.